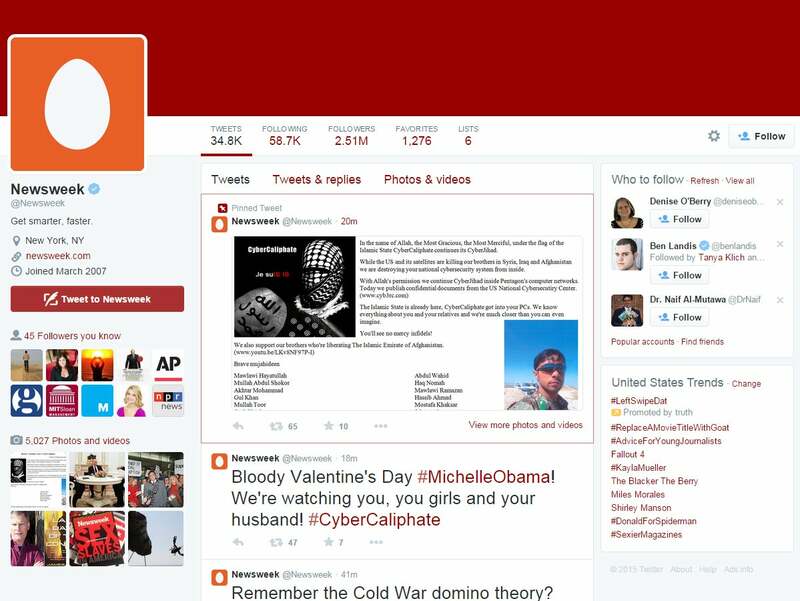 Another major social media account has been hacked by a terrorist-affiliated group. On Tuesday, Newsweek's official Twitter account posted a string of threatening tweets. Hackers who indicated that they were affiliated with the "Cyber Caliphate" took responsibility for the hack. "The Islamic State is already here, CyberCaliphate got into your PCs," reads one image the hackers tweeted. Related: The Next Place Hackers Will Find You? Your Car. One of the tweets threatened Michelle Obama and the rest of the Obama family, while others claimed to leak confidential documents from the Defense Cyber Investigations Training Academy. All tweets were deleted within about 20 minutes of the hack. The "Cyber Caliphate" has claimed responsibility for other social media hacks, including the Malaysia Airlines Website, The Albuquerque Journal and the U.S. Central Commands Twitter account. The group claims to have affiliation with the terrorist organization ISIS. Other recent high-profile hacks include a racist hijacking of Chipotle's Twitter and Taylor Swift's social media attack by a group apparently linked to the Cyber Caliphate that claimed responsibility for December's PlayStation hack.